NGOs and committees opposed the project and made alliance with scientists to denounce the impacts. The plant was scrapped and a National Park was established. According to the industry, Russian territory is rich in hydropower potential amounting to 10% of the world total, which is mainly in Siberia and the Far East, where the electricity demands and hydropower development are low. With the long-distance transmission technology maturing, dam developers think it is more feasible to transmit power from Russian Far East and Siberia to China. In 2001 the two countries signed the Treaty on Good-Neighborliness, Friendship and Cooperation and energy generation was one of the cooperation chapters. In the long run, it is an inevitable trend to meet the electricity demand in Northeastern and Northern China, and to jointly develop hydropower resources in Russia, and transmission power to China . The Amur River basin is the largest still free-flowing transboundary river system of Asia and is internationally recognised for the importance of its migratory fish and floodplain wetlands, of which 17 are designated Ramsar sites. By 2013, there are 100 hydropower plants in Amur River Basin, only two of those in Russia. 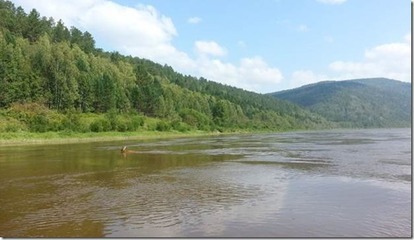 Shilka river is a primary source of Amur, flowing from Mongolia into Russia. On both these rivers, large hydropower plants are under study by Russian authorities. In 2012, EuroSibEnergo, the largest independent power producer in Russia, and China Yangtze Power Co. («CYPC»), the largest Chinese listed hydroelectricity producer, signed a Framework Agreement that provides for joint investment of a list of power plant construction projects in Eastern Siberia. The top priority ones are: 1. Lenskaya CHP. Installed capacity — up to 1,200 MW; location — Ust-Kut, Irkutsk region; 2. Nizhne-Angarskaya HPP (Angara river). Installed capacity — 600 — 1,500 MW; location — Krasnoyarsk Region 3. Trans-Sibirskaya HPP (Shilka River). Installed capacity — 400 — 900 MW; location — ca. 250 km from Mogocha, Trans-Baikal Territory. According to the developer, Trans-Sibirskaya HPP will provide an opportunity to synchronize the power systems of Siberia and the Russian Far East; it could also meet power demand of the Chinea polymetal deposit development project (implemented by En+ Group) and other mineral resources recovery projects in the Trans-Baikal Territory. Rivers without Boundaries, a coalition of environmental organizations from different countries which was formed in 2009, advocates for a different management of the free flowing rivers of this region, based on a diversification of sustainable activities. Once EuroSibEnergo-En+, learned about the upcoming campaign it came up with public announcement on Trans-Sibirskaya Hydro claiming it has nothing to do with damming practices of the past, that it adheres to principles of sustainable development and electricity will go primarily to domestic Russian consumers, not to Chinese market. However, the coalition questions the project's location in the lower reaches of Shilka, which would block\isolate 200000 square kilometres or 10% of Amur River basin; they fear that the reservoir will be contaminated with rotting wood and toxic substances from mining complexes upstream. They express concerns over ESE's performance in other projects, allegedly having very poor record meeting environment and social standards. In terms of local biodiversity, preliminary assessment done by Amur WWF and RwB shows that the new dam would likely have negative impacts on IUCN-listed Kaluga sturgeon, many salmonid fish, as well as of fisheries tourism in upstream Mongolia, likely, dependent on Shilka and Upper Amur as source of fish stock replenishment. 450 kilometer long reservoir will occupy roughly a half of Shilka River proper. It will block important migration corridor between Amur river and northern Dauria, exterminate floodplain communities unique for Dauria, drown many important historic sites. The Public Chamber of Zabaikalsky Region held special hearings with experts and NGO representatives and ministers of regional government present. The regional government was trying to prove that energy is needed by Russian regions, but experts, knowing the situation claimed that the Russian Far East was not currently facing a need for additional power, as two existing hydropower plants on the Zeya and Bureya rivers were fully meeting its demands. This meeting had huge press coverage and follow-up discussion on internet forums. Vote on popular website revealed that 58% of people are against the project, while 30% lack information to make judgement. Many and diversified groups expressed opposition (Federation of Trade Unions of the Amur region, the Youth Parliament of the Amur region, the Association of Industrialists, Entrepreneurs and Employers of the Amur region of other environmental NGOs). Among the arguments, some are purely environmental – a violation of the migration routes of aquatic animals, changes in hydrological regime and the regime of sediment runoff, flooding areas, but also economic – obstruction of navigable waterways, unprofitability of new generating capacity with no load and no existing power lines. People of the Amursky Region, possessing two large hydropower stations, better than anyone else know about threats of damming a river. So they prefer to act well in advance to prevent this from happening upstream. Scientists and energy experts seem to agree on the fact that the region and Russia do not need such plant; Transsiberian (Shilkinskaya) HPP will pave the way for the construction of a minimum of three hydroelectric power stations on the mainstream of the Amur River, which has been a long dream of China. During March/April 2012 a series of events during a Week of Mobilizations  included many roundtables with scientists and government agencies. 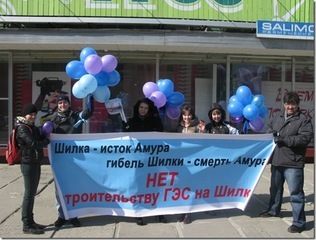 Much media attention was there and thousands of people sign an online petition to stop constructions. A day before the World Water Day, En+ Group informed WWF Moscow office that they want to suspend the project and look at other strategic options . They agreed to hold a joint comprehensive study to assess the impact of hydroelectric plants on the ecosystem of the Amur River Basin. The purpose of the study is to identify and balanced account of all the key factors, including environmental and socio-economic, that should be taken into account when deciding on the possible development of hydro potential of the Amur basin and construction of new hydroelectric plants. Such a comprehensive strategic environmental assessment has been conducted for the first time in the history of hydropower in Russia and the Soviet Union. The research lasted for three years and was finished in 2015. The list of possible dam locations in the Amur basin was determined, and potential environmental and socio-economic impacts of the development on the region were analyzed . In December 2015, after 7 years of negotiations, the Governor of Zabaikalsky Province signed the decree to establish Verkhneamursky (Upper Amur) Wildlife Refuge in Mogochinsky district of Zabaikalsky Province on the area of 239,639 hectares. This area fully covers five alternative potential sites of Trassibirskaya Hydro Dam and its counter-regulator Utesnaya Dam on Shilka as well as a planned site for Amazarsky dam on Amur itself. One of questions discussed was reducing potential negative impacts from logging and damming activities by Polyarnaya (Xinban Guoji) a Chinese company since 2004 building a pulp mill and sawmill in the forests adjacent to new protected area. The Zabaikalsky Vice-Governor Aleksander Shemetov promised to the High Council that old growth forests presently leased by Chinese loggers will be taken from them and added to the Upper-Amur wildlife refuge . Project Details This is one of several projects. Installed capacity — 400 — 900 MW; location — ca. 250 km from Mogocha, Trans-Baikal Territory. Trans-Sibirskaya HPP will provide an opportunity to synchronize the power systems of Siberia and the Russian Far East; it could also meet power demand of the Chinea polymetal deposit development project (implemented by En+ Group) and other mineral resources recovery projects in the Trans-Baikal Territory. This is a description from Rivers without Boundaries: "En+ESE proposed Trans-Sibirskaya Hydro in Zabaikalsky Province, on the Shilka River – the source of the Amur River with 450 kilometer long reservoir, that in length will occupy roughly a half of the Shilka River proper. It will fully block the Shilka River watershed, disrupt important migration corridor between the Amur river and northern Dauria, exterminate floodplain communities unique for Dauria, drown 130 important historic sites and 20 settlements. Reservoir will be contaminated with rotting wood and toxic substances from mining complexes upstream, it will exterminate local fish including giant Kaluga Sturgeon–endemic of the Amur. CYPC and Three gorges Co. eye this project in the headwaters of the Amur as a first step to build dams on the Amur River main transboundary channel." Other Submergence of archeological sites. This is a transboundary conflict between Russia and China. Why? Explain briefly. The EJOs coalition managed to suspend the project and to participate to the impact assessment study; many scientists and groups of youth participated to the mobilization and street petitions also proved successful. Also, a large area was then devoted to a National Park. However, it is not clear whether Russian and/or Chinese companies will still get their share of the river basin for future hydropower projects at the only cost of the implementation of some stricter environmental standards. Report from Rivers without Boundaries, Transsibirskaya Hydro Planned in Amur River Headwaters. RwB - Hydro on Shilka suspended?